Ontario is home to some of the finest bass fishing waters in the world. Which lakes rank as the best in the province? There are many lists of best bass lakes in various locales but how do you truly go about assessing which ones are best without just giving an opinion? Well, you need data! So to that end – I’ve combed through the past 10 years of tournament results for various lakes and rivers in Ontario. The results are based on an average of the winning (or daily best) five fish weights from events from thirteen major tournament tours in Ontario. These events generally feature a minimum of 30 or more boats with many having over 100 boats in each event. Of course this will limit the results to larger venues that can handle a large field of anglers and also eliminate remote waters. There are many small unpressured lakes in Ontario that can churn out a bonanza of five pounders but they’d never hold up to large tournament angling pressure. My smaller cottage lake in the Parry Sound area would fit in this category. There are also a number of bigger lakes that don’t see much large tournament action but are still well known bass hot-spots – the upper French River, Lake Nipissing and Lake Manitou come to mind in this regard. There are some possibilities here for data bias. Some tournaments are single day events and some are multi-day events – and on some bodies of water the size of catch decreased as the tournaments progressed. Angler skill may vary from tour to tour and the size of the tournaments may also play a role. More anglers may mean a bigger chance that a large bag may come to the scales. It may also mean that lots of anglers on a lake that “fishes small” may not hold up to the pressure resulting in smaller bags, especially on multi-day events. Timing of the tournaments will also play a role – late season smallmouth are generally bigger than just after spawning. However, for many of the top lakes we have a good sample size that should help to eliminate any bias. The raw tournament data used for this ranking can be found here. 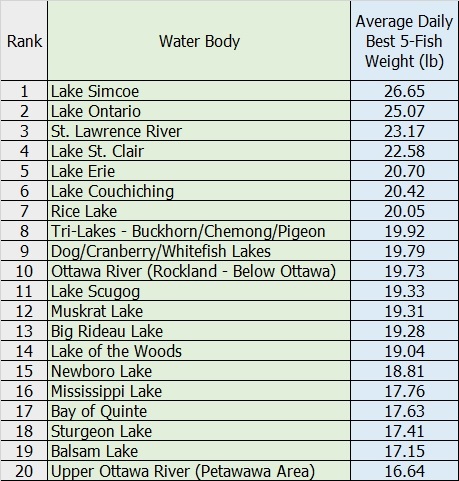 Best bass lakes in Ontario based on average tournament best daily five fish limit weights. It’s no surprise that Lake Simcoe comes out at the top of this list. 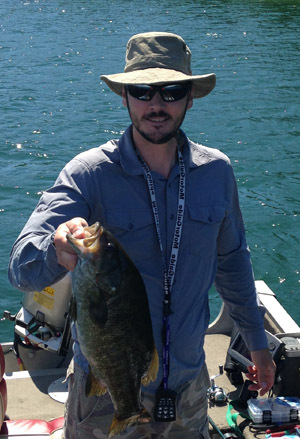 Simcoe has been churning out massive bags of smallmouth for quite some time. A new Canadian tournament record of 31.80 lb was just recorded at the 2017 Lake Simcoe Open (October, 2017) by Jason Clay and Matt Nicholas. This eclipsed the previous record of 31.5 lb set in 2010 on Lake Simcoe by Mark Moran and Joe Muszynski. Additionally, six and seven (and even eight!) pounders are needed for big fish prizes! Lake Couchiching, connected to Simcoe at Orilla took sixth place. The St. Lawrence River averaged 23.17 lb, however the winning weights varied a fair bit depending on locale. The Thousand Islands area (near Gananoque) boasted 25.41 lb daily leading weights – which would actually put it ahead of Lake Ontario, but St. Lawrence’s overall average was lowered by weights from the Morrisburg (21.42 lb) and Lake St. Francis (23.65 lb – at the Ontario/Quebec border) areas. Another Elite tour stop, Lake St. Clair boasted 22.58 lb and has the added bonus of also being one of the world’s top muskie fisheries. A 30 lb tournament bag was recently recorded in a tournament out of the Michigan side of the lake. Lake Erie rounds out the top five with 20.70 lb. If we exclude tournaments confined to Rondeau Bay, a largemouth fishery with a 16.87 lb five fish average, the main lake average rises to 21.46 lb – still holding it in fifth place. A large number of Kawartha Lakes (Buckhorn/Chemong/Pigeon, Sturgeon, Balsam) and lakes along the Trent-Severn Waterway (Scugog, Rice) made the list. These are eutrophic fisheries that support large populations of sportfish. The Rideau Lakes area also boast a number of entries (Big Rideau, Newboro, Dog/Cranberry/Whitefish) as did lakes near the Ottawa River (Muskrat, Mississippi) along with the river itself. The Bay of Quinte, a huge walleye factory, also made the list for bass. Lake of the Woods, from the northeast end of the province, is also a destination spot for bass. So there you have what the hard data has to say on the best bass fisheries in Ontario. There’s a number of these I haven’t fished yet – time to plan some trips! Lake Science, Largemouth Bass, Smallmouth Bass, Tournaments.